I would imagine that sort of conversion would be alot more trouble than its worth. Probably make alot more sense just to get the whole new H9 model.They probably charge at least half the price of the full kit for the wing anyway. It must be a good bit bigger/heavier if its 30cc, the biggest engine you could put on the .60 is 10cc. 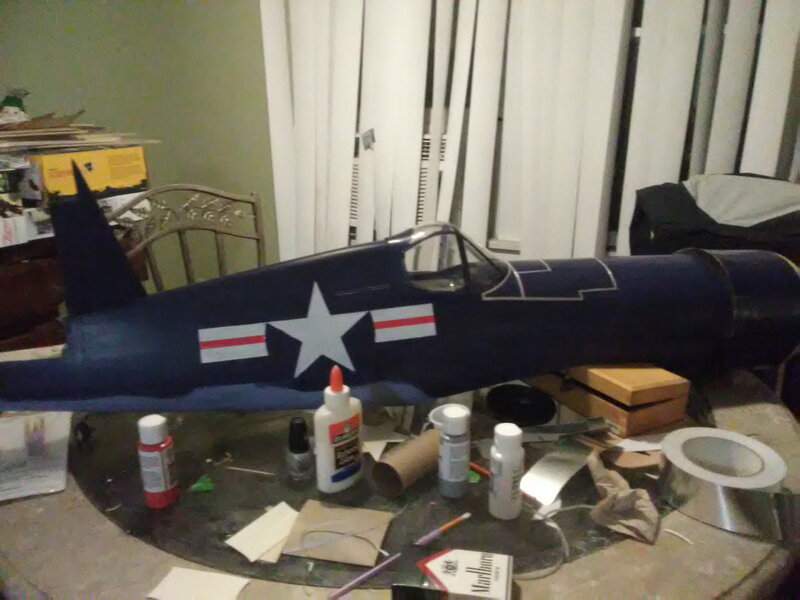 I wonder if the wing from the recently announced H9 30cc F4U will work on my .60-size H9 Corsair. Appears to about the same scale. That would provide flaps and a more scale wing. Ummm..... it's a 20cc size model not 30cc; 65" wingspan. So they are practically the same size regards fuselage length and wingspan. There is a big difference in weight though. The highest specified weight for the 60 size was 8.5lb whereas its 13.5lbs for the new version. Wing area of the 60 is 752 sq in, 20cc is 802 sq in. Does not really add up, 13.5lbs is very heavy for a model that size. I wonder did they solve the old problems of the 60 in the new model. I see they solved the dodgy retracts problem by just not including any with the new version! Last edited by shane55; 12-29-2014 at 02:32 PM. To all the guys who have had problems with their wings folding , i feel your pain , mine did it on her 7th flight . Of course i powered her with electric tacon 110 on 8 cells spinning first an 18 ×10 apc then for even MORE speed an apc electric 16×12 . Both props pulled 70 amps at wot at 8000 rpm on the ground . The plane had complete unlimited vertical with both props , a buddy flew it straight up and out of sight ! The 16×12 seemed to have about 15 mph more speed than the 18×10 . No radar gun but the guys all thought it was in the 100 mph range . A complete blast to fligh ! The left wing came off right on the outside edge of the oil cooler , there is no leading edge spare there , it is cut off to make room . Now i am not blaming hangar 9 for the wing failure even though i feel it is a dumb design , but i put the blame on the fact that i overpowered the plane . Guys that plane flighs like a dream at 4 1/4 inch from leading edge . I love it so much i am modifying a second one but this time i am going for 10 cells for even MORE speed , lol ! Decided to make this one glow , os 110 alpha . Have completely bashed this one .